Fleurs de Jardin jewelry is made with unique hand-made lampworked glass beads carefully designed and fabricated by Fiona M. Dejardin. Each bead is meticulously crafted at a torch and is a unique object in its own right that can be appreciated as a miniature sculpture or an exquisite adornment. For more information about lampworking go here: http://en.wikipedia.org/wiki/Lampworking. 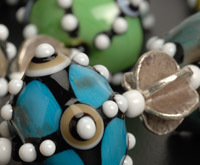 The beads are then incorporated into unique jewelry designs also created by the artist. Additional materials, such as semi precious stones, pearls and Thai silver are combined with the glass beads to create a dialogue between color, pattern, texture and materials. The elegant designs often refer to the artist’s interest in art history, gardening, nature and the universe. Fiona M. Dejardin was born in Glasgow, Scotland, grew up in Lincolnshire, England and then moved to the United States. As a child she was fascinated with kaleidoscopes, seed beads and marbles and this interest led her to a deep appreciation of glass in all of its forms. She currently lives upstate New York where she is a Professor of Art History at Hartwick College. She has been making beads for about nine years and has studied with Kristina Logan and Caitlin Hyde, who have provided her with technical knowledge and substantial inspiration. Her work was recently included in the publication Bead Review: Book 3.